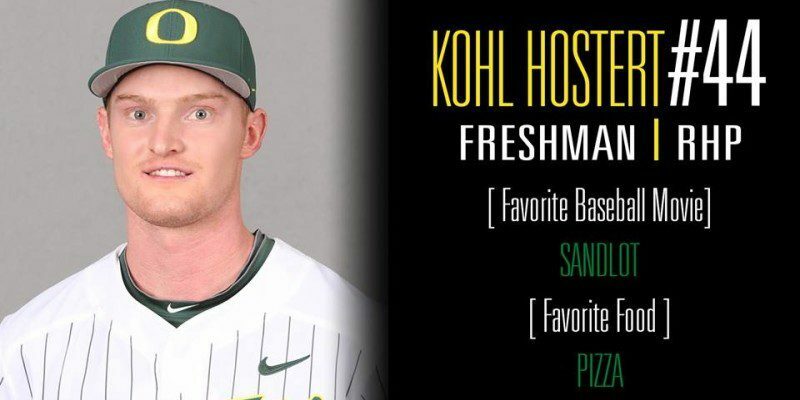 On March 25th the Oregon Ducks baseball team played and beat UC Riverside – but not without the help of freshman redshirt RHP Kohl Hostert. Hostert fanned the side in the sixth after entering the game with no outs and a runner on second. He went on to retire the first 10 batters he faced. As reported by GoDucks.com, very impressive for a freshman’s first game out of the bullpen. Hostert retired 12 of 13 batters in his 1st career save. His stats for the day: 4 innings pitched, with no hits, no runs, no walks, and 5 strikeouts. I am sure he was able to fulfill the team’s expectations of him with those numbers. As with any Duck there are fans and praise, which is exactly what Hostert received. A gracious Hostert tweeted his appreciation on Thursday. Hostert hails from Idaho Falls, Idaho, where he attended Bonneville High School and graduated in 2014 as a four-year letterman and a multi-sport athlete. He ended his senior season with first team all-league and first team all-state honors. His senior year ended with an 8-2 record — including a perfect game – and an ERA of 1.40 with 71 strikeouts. Oregon Duck fans could be treated to more of the same after Hastert chalked up his first career save.